Prenco Environmental Spill Control provides a unique range of products and services to protect against and safely handle all kinds of environmentally hazardous spills on land and water to help prevent pollution. By choosing Prenco, you will receive expert advice on spill control issues and a rapid response to queries. The company provides high-quality products that will not let you down. Prenco offers absorbent product solutions for spills of any fluid, whether on hard surfaces, into soil or water. Different types of absorbents are required to tackle various liquids, to encapsulate and/or neutralise them to safe levels so that the spill is quickly and efficiently managed. 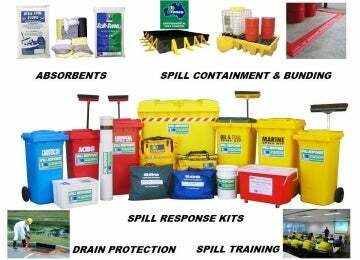 Spill kits are available according to the type and risk of fluid spilt, and their components can be adjusted to suit your operation. All items in Prenco’s spill kits can be individually re-ordered, so they are always fully stocked. They may also be colour-coded to assist quick identification. Prenco staff travel nationwide across Australia to deliver training in responding to spill events, following site emergency plans, use of spill equipment and PPE, which are all required by WHS and Environmental legislation. Ensure your employees are ready to respond safely to plan when attending a spill. Prenco offers spill response training courses tailored to a variety of levels, the specific risks and response products on your site. Both accredited with assessment-level training, as well as non-accredited attendance-only level training courses are available. For more information, please fill out the enquiry form below and you will receive a prompt response. A range of new spill kits has been released by Prenco specifically to deal with spills of AdBlue fluid, also known as selective catalytic reduction (SCR) aqueous ammonia and diesel exhaust fluid (DEF), which is now being introduced to the Australian market. Prenco explains the difference between AdBlue (DEF, SCR, aqueous urea solution) and oil and fuel chemicals, and why spill kits are designed for the specific liquids they will be cleaning up. Whatever fluid that may spill and in any location, Prenco has an absorbent product that can be used to control, contain and clean-up that fluid. An essential item for any mining and industrial site that stores and transports fluids and has plant and machinery with fuel / hydraulic tanks is a leak sealant putty or plug. Spills of oils and fuels into the marine environment present a challenge not only to respond quickly to stop the spill from spreading, but also having the right equipment in order to clean up and remove contaminants from the water. Prenco's bunding solutions offer portable / flexible and fixed options for that 'wall', 'dike' or 'barrier' to contain any fluid. Prenco spill kits are not just bins and containers full of absorbents with a sticker on the front, they are built to a high quality with the client’s use in mind and have a number of extra benefits and features to make them functional, risk and site-specific to set them apart. Prenco offers the only range of AdBlue-specific spill kits. Exclusive to Prenco is a new oil and fuel absorbent pad and roll that outperforms all other pads and is made from needle-punched polypropylene. Prenco's range of new dedicated colour-coded AdBlue spill kits are designed to respond efficiently to this fluid and assist in pollution. An information sheet is available to download for further details and advice on spill kit sizes suitable for your site.